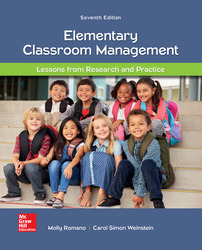 Weinstein’s Elementary Classroom Management, 7e highlights philosophies and actual management practices of five real teachers. These teachers work in different subjects and in diverse classroom settings. Their stories provide real-life illustrations of the concepts and principles derived from research. Practical tips boxes provide useful classroom management strategies while pause and reflect boxes promote engagement and comprehension.